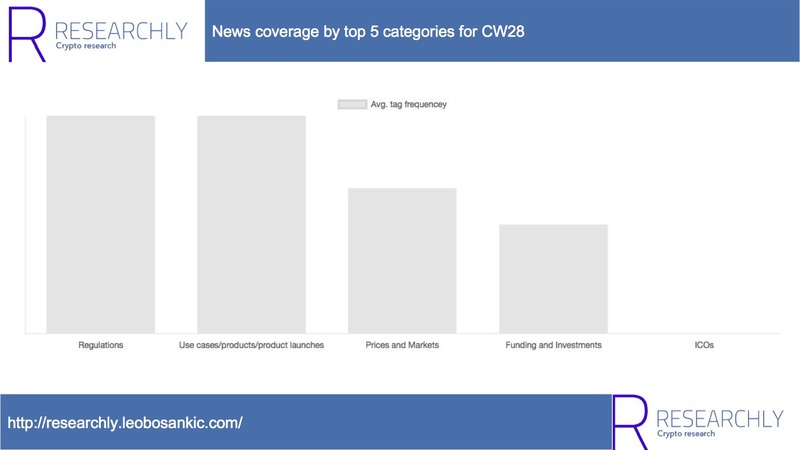 This report covers ICO fundings, dapps (based on dappradar), and news sentiment for CW 28. 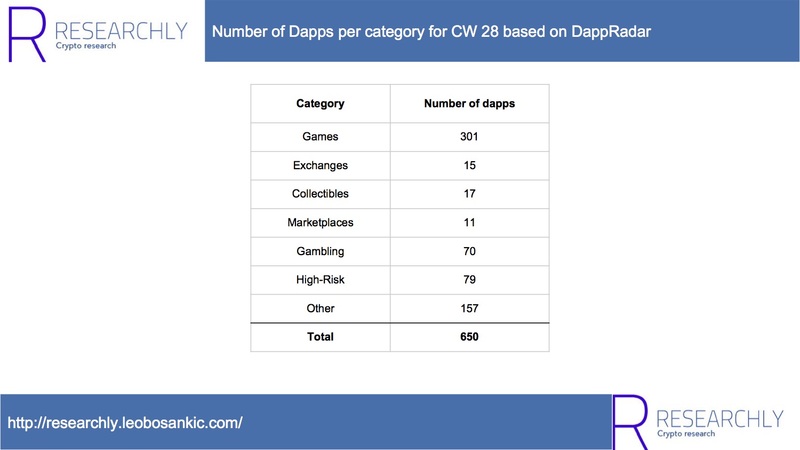 There were a total of 650 dapps, most of them in Games (301), followed by Gambling (70), High-Risk (79), and Other (157; although I would re-categorize some into other categories). Based on transaction volume, exchanges were unsurprisingly the most active. Something I am still looking for is some AR-related game. With Pokemon Go, it helped push AR into the mainstream and in this case as Nick Tomaino writes it “gives social context for NFTs”. Besides that, I believe that AR could push other crypto areas such as Crypto Donations although it probably wouldn’t work without geospatial data on blockchains. In combination with Marketplaces, Collectibles had the lowest liquidity (measured by the number of users) although liquidity is highly important here. Moreover, one of the promises behind tokenization actually is higher liquidity. More generally, we can see a combination of purely virtual assets (e.g. Cryptokitties) and virtual representations of real-world assets such as CryptoArts. Those, however, do not equal tokenized investment into the real artwork like with Macenas. Also, the lines between Collectibles and Games are blurring. 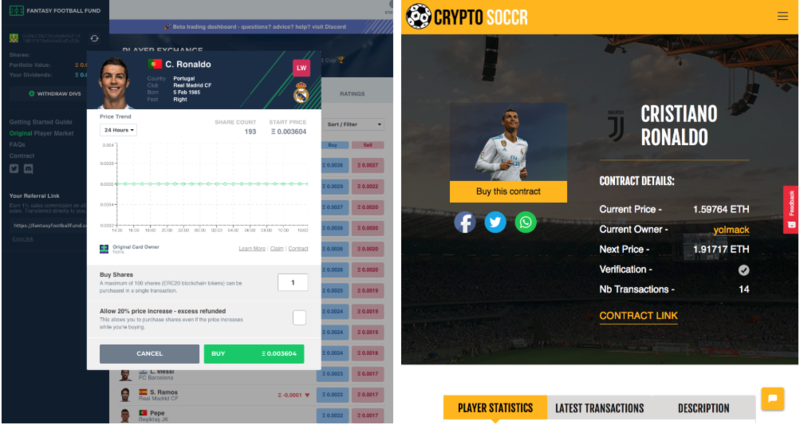 With CryptoSoccr, for instance, gamers can collect football players but also participate in bets. It also turns out that democratization leads to the virtual duplicates. For instance, with trading cards such as cryptosoccr or fantasyfootballfund different cards of the same football players can be traded. This means that there a two version of one player. In the long run, I am curious what dynamic we will see here; Will we see one brand (e.g. Panini in the non-virtual world) for football players or will multiple brands co-exist? Also, applications will get really exciting when liquidity increases and companies start tokenizing real-world assets but in regards to the issuances of purely virtual assets (e.g. Cryptokitties), I am actually unsure how their advantage to normal “non-unique” virtual assets will translate into the mainstream. For marketplaces liquidity (measured by the number of users) is the most important metric. Currently, it is not given; from the 11 marketplaces only three have users; Decentraland Marketplaces (12 users), EMoon (2 users), and OpenSea (2 users). Here Fomo3D had by far the most users and based on balance Etheroll scored first, followed by vDice and Fomo3D. 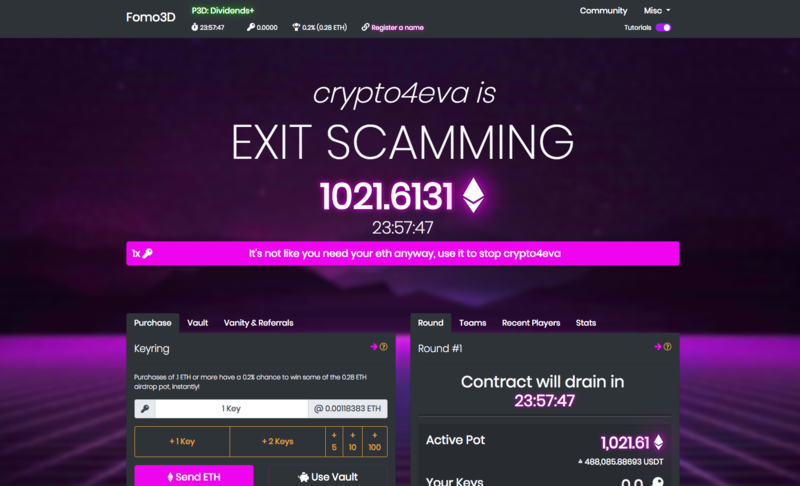 Fomo3D is a lottery with a counter where gamers buy into a pool and the last person that bought a ticket receives the whole pot when the counter expires. Fomo3D is especially noteworthy because they started only a couple of days ago, while Etheroll and vDice have been around for quite some time. 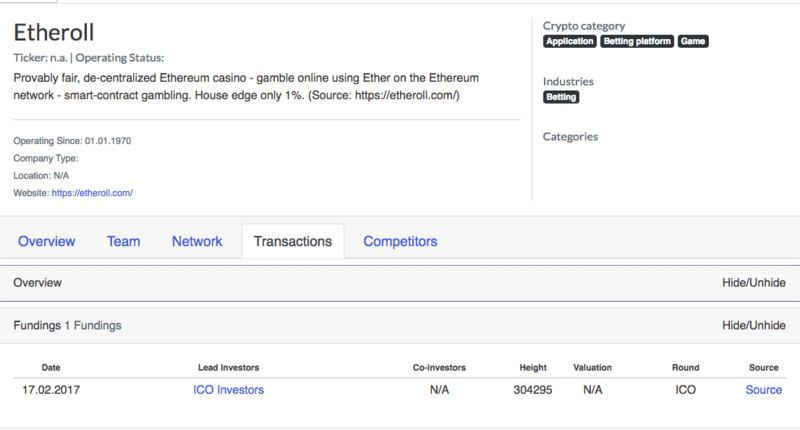 (Etheroll raised $300 in their ICO in February 2017 and vDice $1,8 Mio. in their ICO in 2016). Based on user numbers and balance PoWH 3D was the most successful one. PoWH 3D (previously named PoWH) has been around for half a year and it is the biggest pyramid scheme on Ethereum so far. Others in this category such as Proof of Stable Coin, Proof Of Only HODLing, or Proof of Trevon James are variations of PoWH3D. 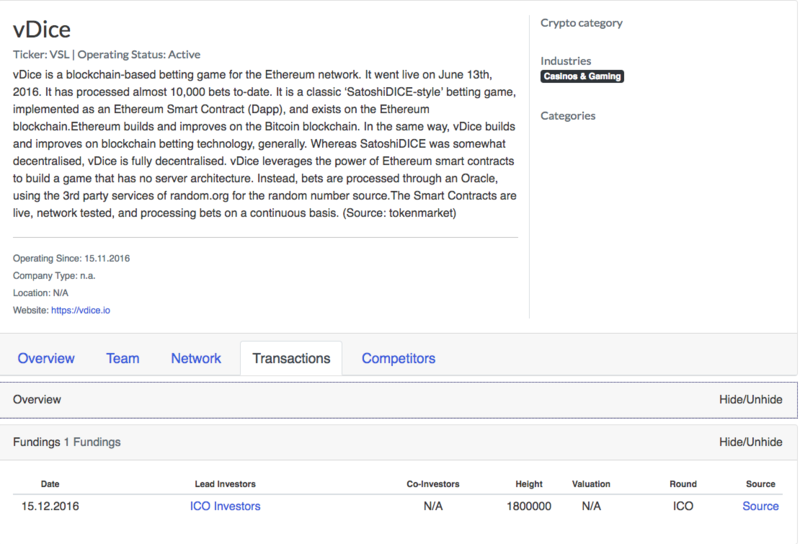 Based on balance Augur, which launched this week, is the #1. The others here I would categorize as games (ETHPhoenic, EtherKingdoms, P4ARTY) and DEX (Poexer). Besides that, I want to highlight latium. 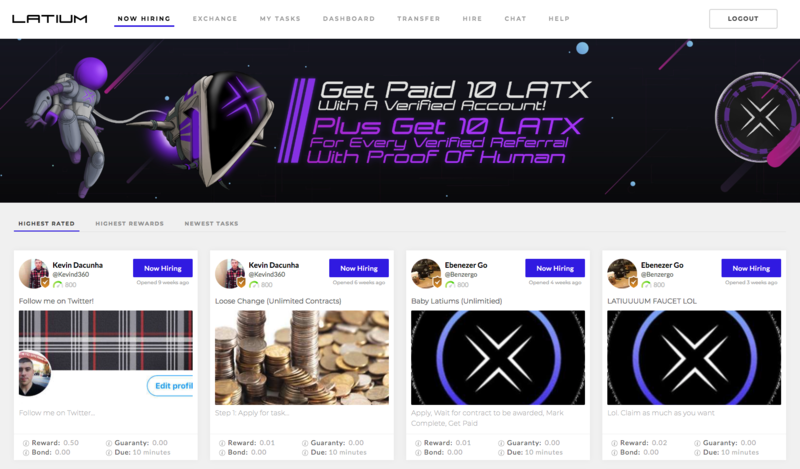 latium is a task platform, conceptually similar to earn where people pay others for (mostly crypto-related) tasks (e.g. follow somebody on Twitter). Generally, task platforms are well suited for direct, intermediary-free interactions because platforms cannot do much more than provide liquidity. The most important part of task platforms – ensuring task quality – lies outside their control. Blockchains provide several concepts to manage such intermediary-less task platforms (e.g. token-curated registries for reputation management) but the biggest issue – verifying task completion – remains. Although oracles could be a solution here I am unsure whether this would justify the overhead. There was almost no ICO activity last week. In total two companies, Verasity and Sparkster, “finished” their ICO. Verasity is a video sharing platform and Sparkster a Drag and Drop Software Development platform to “Build Software with NO CODE”. the price of Ethereum has dropped over 40% and market sentiment is down. This has slowed the Verasity sale, as well as many other top tier ICO’s we have been following. Investors wanting to back Verasity are out of the market until conditions improve. This limited ICO activity collides nicely with the output of Researchly’s industry sentiment tool. Although ICO-related news were present, they were by far the most underrepresented category. What ranked high, however, were Regulations, Use cases/products/product launches, Prices and Markets, and Funding and Investments. There were a few launches and announcements last week. Wallet wars: Opera announced to add a wallet to their browser. Although it is a statement against the Brave browser (as part of the Basic Attention Token), I would not call it a browser war as Autonomous does but rather another puzzle in the ongoing crypto wallets war. HTC’s new “blockchain smartphone” to be released this year will apparently come with Cryptokitties out of the box. As the smartphone is not marketed for the mainstream market, I doubt that it will push the overall crypto space. Nevertheless, the fact that two smartphone manufacturers are working on blockchain smartphones (besides HTC also Sirin Labs) is noteworthy. First, this pushes blockchains more into the mainstream especially because it happens through such socially visible objects like smartphones. Secondly, it shows that innovation in the smartphone space is still possible although “blockchain-enabled” probably won’t become a long-lasting USP that would affect current market shares. So, no wars here. Major League Baseball’s announcement to issue baseball collectibles is worth a mention because it reiterates the growing interest in tokenizing assets such as trading cards. The discussion that sparked around allegations that the Russians interfering in the US-election used bitcoins. The SEC charged Jesky and DeStefano for illegally selling stocks of their alleged blockchain firm and sentenced LocalBitcoins Trader Bitcoin Maven for “unlicensed money transmitting and money laundering”. Although ICOs are apparently becoming less interesting, trading is not (the news around crypto custodians is a good indicator). Most talks centered around the bear market and potential upswings. Notable price movements (as being rooted in news) were seen in Cardano, Basic Attention Token, Stellar Lumens, Zcash, and 0x due to Coinbase considering adding them. Some upside movement was also visible in Litecoin upon their announcement to acquire a stake in German bank WEG Bank.